Even in this age of a prodigious supply of computer programs and mobile device apps (OK, apps are also computer programs) to calculate circuit component values and responses, having a cool graph to look at can take a lot of mystery out of the results. Depending on the sophistication of your software, calculated values can be unrealizable in real life (size, power handling, standard values, Q, operational frequency, etc. ), or maybe you have a box full of parts you want to use and the suggested value is not readily available. In those instances and others, being able to grab a handy-dandy design chart to see where component values lie with respect to all design parameters, in this case load impedance, desired power supply ripple, inductance and capacitance. Author A.L. Teubner describes the process for using his ripple filter graph and provides an example. Performance of single-section choke-input filters can be determined readily by use of straightedge. The chief characteristic of a power-supply filter is, of course, how well it filters - how little a.c. ripple voltage is present at the output terminals. This chart makes it easy to check the usefulness of a particular combination of L and C without long calculations or impedance diagrams. The chart is constructed to represent a single-section choke-input LC filter like the circuit shown on the chart. The resistor RL represents the total effective load resistance connected to the power supply: the supply voltage divided by the full load current. 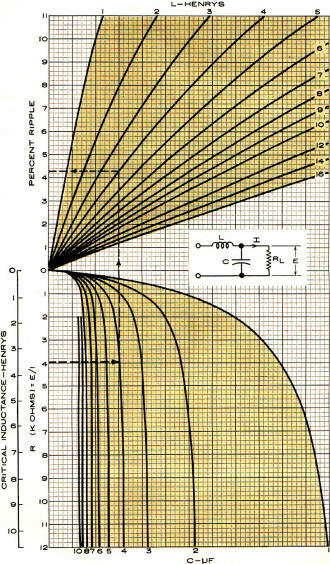 The bleeder resistor can be included in the calculation of load resistance if desired; the effect that it will have on the filtering depends on the curvature of the "C" curve being used. The answer obtained is the percent ripple, which is defined as the r.m.s. value of the output ripple voltage, times 100, divided by the d.c. voltage. 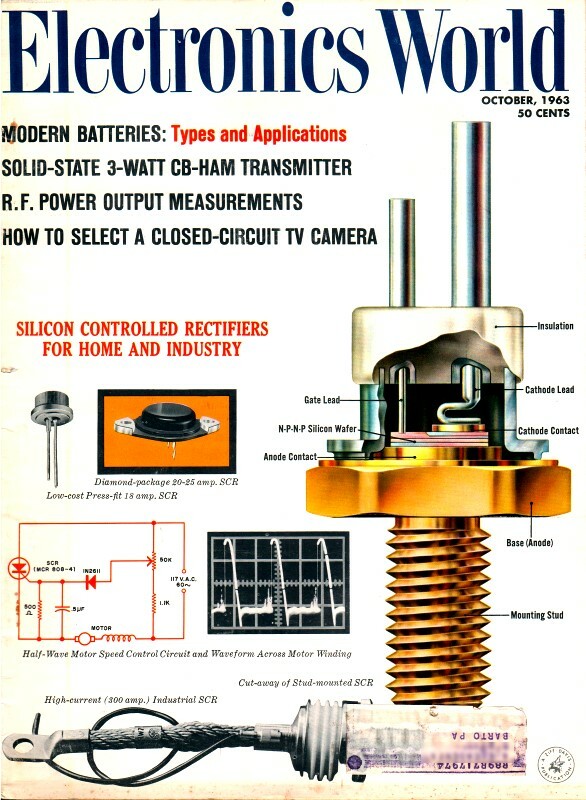 An additional scale for critical inductance is placed just beside the resistance scale. This is the minimum value of inductance that should be used to prevent the output voltage from rising toward peak a.c. voltage when small current is being drawn, such as when the load is removed and only bleeder current flows. The simplest problem that can be solved with this chart is shown by the following example, which is illustrated on the chart itself. Suppose that you need a 100-volt power supply that will deliver 25 ma. full load and you want to know whether a 4-henry choke and a 4-μf. capacitor will give sufficient filtering. Dividing voltage by current gives a load resistance of 4000 ohms. The horizontal line passing through 4k ohms on the RL scale cuts the 4-μf. C curve at some point. A vertical line is drawn from this point upward until it cuts the 4-henry L curve in the top section of the chart. Then a horizontal line is drawn through this new point, and the answer is read where it cuts the "% Ripple" axis - in this case, 4.3%. Whether this is sufficiently small depends on the equipment using the supply. The filtering ability of a two-section choke-input filter can be determined by using the nomogram twice, once for each LC section; converting the two values of percent ripple to decimal fractions; multiplying them together; and then multiplying the product by 100 to obtain an over-all percent ripple output. The same value of RL can be used for both sections with small error. By repeating the construction in the example above, you can check the filter's performance for varying load currents. 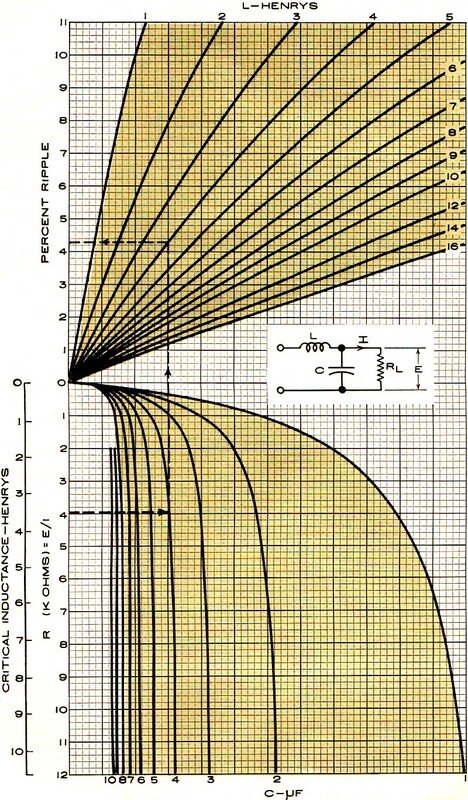 If a swinging choke is used, a similar series of constructions will show its effect, if the proper L curve is used for each value of load current. In constructing a chart such as this, it has been necessary to ignore certain problems, such as choke, transformer, and rectifier voltage drops; choke core saturation; bleeder current; and component voltage and current ratings. To completely analyze a power supply you must, of course, take these into account. However, this chart can provide quick, easy solutions for the problem of filter design, and save a lot of "calculations."